This knitted truck has a trailer on the back to store toys or perhaps some candy and treats. 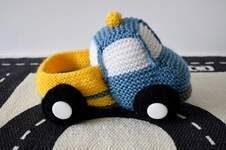 TECHNIQUES: The truck is knitted flat on straight knitting needles, and knitted in garter stitch. You will need to cast on and off, knit, purl, work increases and decreases, sew seams, and turn the work part way through a row. For colour-work, you will need to know how to knit stripes (i.e change colour at the end of a row). The window struts are added after making up - I made single crochet chains yo sew onto the windows, but you could use chain stitch embroidery if you don’t know how to crochet. FINISHED SIZE: The truck is approximately 10cm tall, 17cm long and 10cm wide.